At Ecolab, the world’s largest sustainability service provider focused on industrial water, energy and air applications, IT leaders realized that the organization’s technology portfolio was converging, but its infrastructure and operations teams were working in silos. This organization structure led to ineffective communication, monitoring operations that were vertically focused and not organizationally aligned, and an IT group that was more reactive to problems rather than taking a proactive approach to ensuring critical application and service performance. 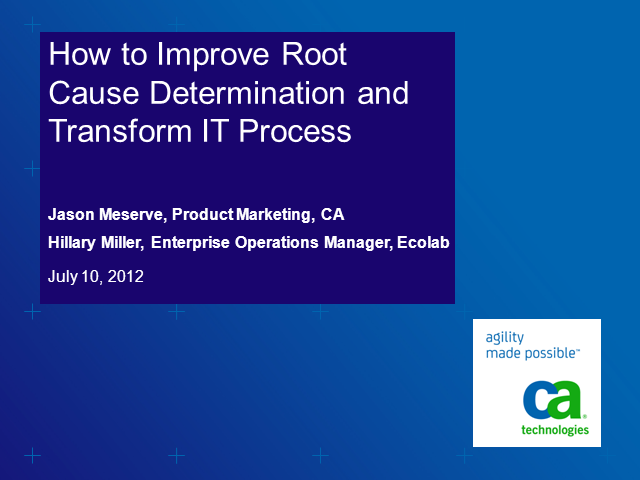 In this Webcast, Hillary Miller, Enterprise Operations Manager, Global Infrastructure & Operations, Ecolab, will share how her organization embarked on a three-year mission to better align the infrastructure and operations strategy with the over IT strategy, better align staffing to meet needs, improve communication between the various silos, and the tools used to bring a more cohesive monitoring and management strategy to the IT group. If your IT organization is looking to provide a set of effective and efficient services to support the technology demands of your business operations and customers, register for this Webcast.